I’ve spent the past month building a new desktop computer. An additional 120mm fan to put on the side door.. I messed up on the memory as it is a Quad kit and the board is triple channel… didn’t realized that until after the fact and everything still works so I’m not going about changing it. Parts arrived on January 12th. The build went smoothly and spent a day crunching on the MS extended memory tests with no errors. The only surprises were the new ‘triple channel’ thing on the memory and the fact that my 2001 HP scanner (5300C) is not supported in anyway by Windows 7 or HP. HP’s site pretty much says the scanner is too old buy a new one… so I did… I bought a Canan LiDE 700F which I’m quite happy with. Wacom Tablet – do not under any circumstances install the Wacom Mouse Controller from Windows Update. It causes the tablet to work as a mouse and when you install Wacoms Drivers over it causes the tablet to simply NOT work at all! I had to uninstall all drivers for it. Unplug the Wacom. Install the Wacom Drivers. Restart. Replug in the Tablet. Restart. And finally my tablet works properly! Soundcard drivers. Ok the Windows Drivers are ok… but didn’t have nice control for line in etc. 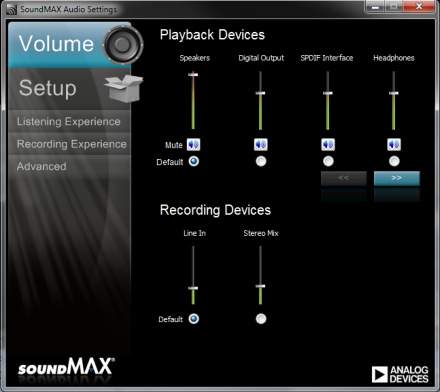 Downloading the SoundMax drivers from ASUS’ site corrected the issue with Line In however, I noticed there was no “What You Hear” or “Stereo Mix” option. Searching around I found the solution. Computer Configuration > Administrative Templates > System > Device Installation. Reboot watch Windows not be able to install its default drivers. Reset the above setting to UNCONFIGURED and finally load the edited drivers from ASUS. And now Stereo Mix is listed as a Recording Device and is usable! The fix involves editing the registry. If you use ZoneAlarm, you’ll have a yellow caution sign on “Teredo Tunneling” in Device Manager. To fix this, in Zone Alarm go to Firewall>Advance and the “Enable IPv6 Networking” must by checked. And one final little QUARK – if you have a large SATA hard drive that for some reason disappears when you quickly come out of Sleep you might want to check out KB977178. Apparently Windows 7 only gives drives 10 secs to respond when you wake from sleep and my 750GB didn’t like that… the hotfix gives the drives a bit more time and I haven’t had any issues since.